Driven and determined, Joanne understands the satisfaction of a job well done and the importance of home and family. It is these qualities that ensure every one of her clients can count on receiving her personal attention. Her hard work, helpful nature and her desire to exceed her client’s expectations have resulting in her being a recipient of the prestigious Royal LePage Diamond Award. This puts her in the top 2% of Royal LePage agents nationally. Joanne’s qualifications and experience allow her to offer a high level of service in a demanding competitive real estate market. She is a great listener who can convert a client’s wishes to reality, bring goals to completion and easily make the real estate experience a fun and pleasant one. Joanne realizes her clients are entrusting her with one of the most valuable possessions they will own in a lifetime. She provides her clients with a thorough knowledge of the area, current product and inventory to help make an informed decision all the while making sure they enjoy the entire process from beginning to end. Joanne enjoys helping her clients through the exciting, complicated and sometimes frustrating experience of real estate buying and selling. She exemplifies honesty, transparency and fairness in all her dealings. Her success can be attributed to an intense work ethic, dedicated customer service and a straightforward candid approach when dealing with her clients. Joanne approaches the very serious subject of buying and selling property with a sense of humour, time-tested experience, sharp negotiating skills and a genuine confidence. I am very fortunate to do what I love in such a gorgeous setting. I am honoured and humbled to be part of such an important chapter in someone’s life and I truly believe that we live in one of the best and most beautiful areas in the world. There’s nothing I love more than to share this community with my clients. 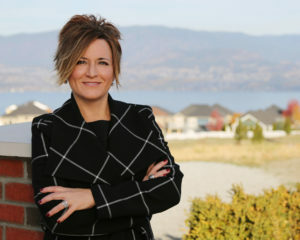 Joanne Willmott has been a trusted name in Kelowna Real Estate for the past 20 years.